Horizontal boards nailed to corner posts located just outside the corners of a proposed building to assist in the accurate layout of foundation and excavation lines. 1. 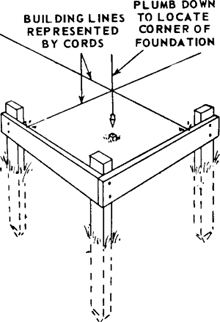 One of a pair of horizontal boards which are nailed (at right angles to each other) to three posts set beyond the corners of a building excavation; used to indicate a desired location; strings, fastened to these boards, are used to indicate the exact corner of a building. 2. One of the boards set across a pipe trench to carry a cord or wire grade line. Additional accessories for the rotating laser include a batter board adapter, batter board receiver holder, facade adapter and tripod. The next day we marked the exact location where each pillar was to sit on its pad using a tape measure and plumb bob and working from the batter board strings. marks and move the end of the string line along the batter board until the distance is exactly 10 ft. Pound a small nail into the batter board where the string crosses it and tie the string to the nail. These valets can be used for multiple applications, and replace wood stakes and cleats used for batter boards, footings and edge boards in concrete construction. Home improvement books and TV shows always recommend laying out deck footings with batter boards and string. For a real-world illustration, use batter boards to mimic the vanishing-edge wall. Use the dimensions from these plates to set up the batter boards and strings (Photos 2 and 3). Use string lines and batter boards to establish the perimeter of your porch (Photo 1). Establish the perimeter of your porch with string lines and batter boards (Photo 2). Adjust the height of the batter boards so the string is level all the way around.